Learn how to improve your volleyball passing technique with these serve receive and bumping tips. Why Do You Pass A Ball? 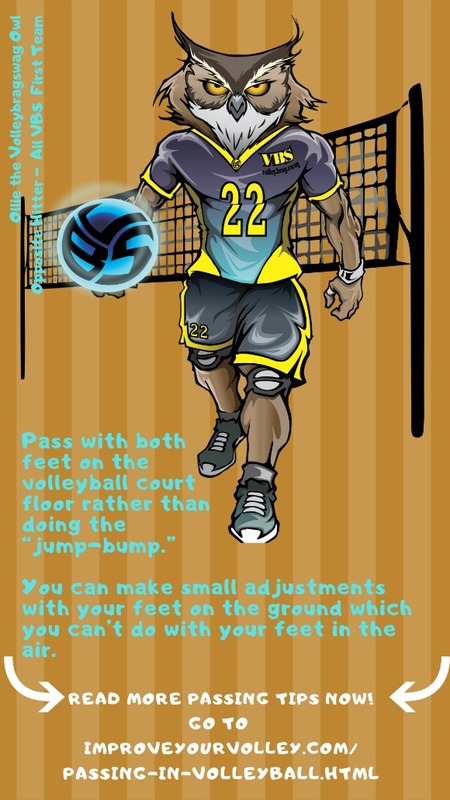 Passing in volleyball is the way to get the ball from one person to another and from one side of the net to the other side by using your straight arms as a platform to contact the ball. 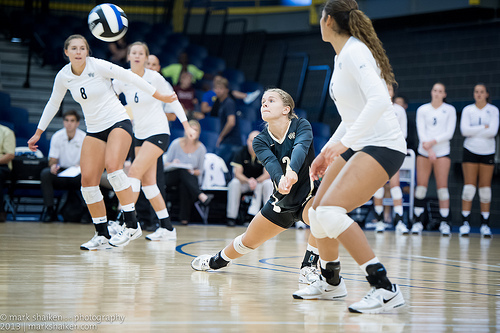 Passing in volleyball occurs most often as the first of three contacts the team in serve receive uses to set up their attack against the defensive team. How do you pass a ball? You keep your hands and wrists pressed together with the fist of one hand inside the other hand while the thumbs of both hands point down to the ground. Keeping the thumbs pointed to the ground when contacting the ball keeps your arms straight. Your arms need to be kept straight in order to maintain a flat surface like the one you would see on a table top. As we say in volleyball, this is your "platform." You would then use your "platform" to make contact with the ball, while angling your arms and shoulders to your target. depending on where you want the ball to go. What Is The "Ready" Position? 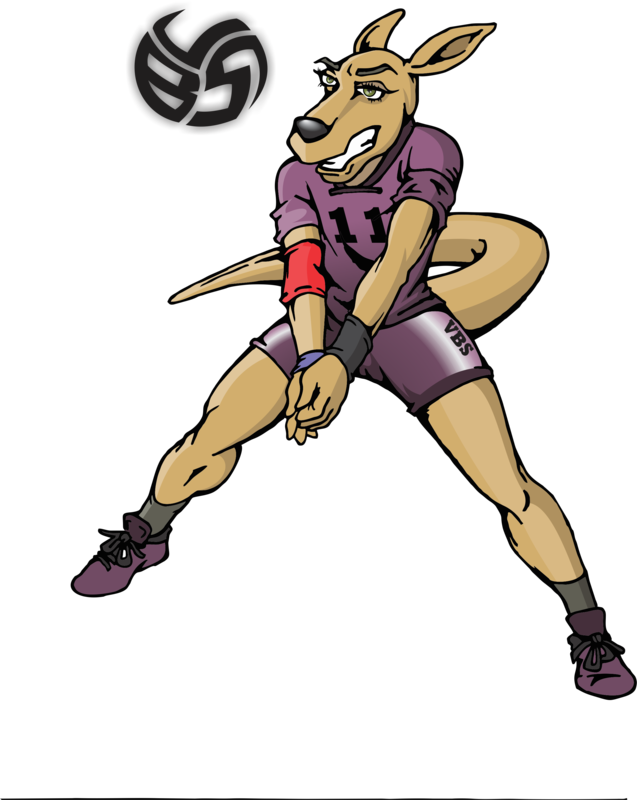 Before the rally starts, a player will position her body in an athletic stance, which many coaches call the "ready position." 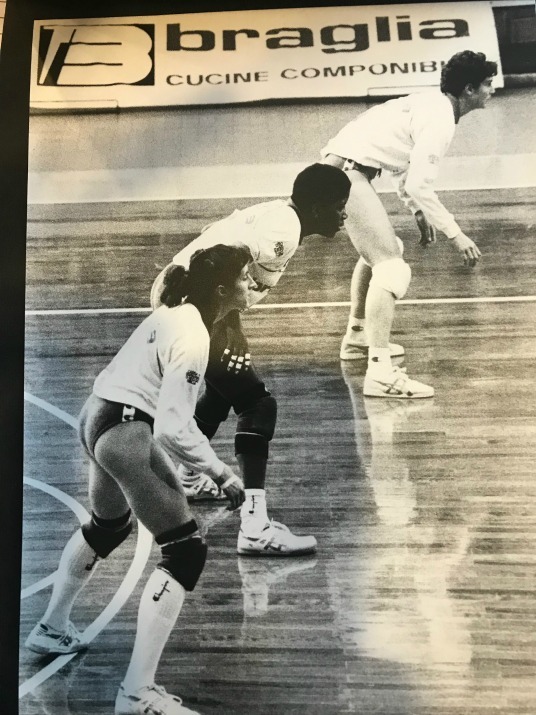 Feet are just outside the shoulders, with knees slightly bent in a loaded position so its easy to move right, left front or backwards to get to where the ball has been served. Shoulders are over the knees and arms are held out in front of you. Your shoulders and upper body should be leaning forward a bit and parallel and squared to the net while you face the server. You don't want your arms too close to you nor do you want them too far away from you. We tell our clients and boot campers that you should be able to fit a volleyball ball under your armpits. That's the perfect distance that your arms should be held away from your body in your ready position. When done correctly this stance prepares you to move quickly to the ball. In our Boot Camp classes we have passers use a shuffle step using big and fast steps to beat the ball to where its going to land. We teach passers to move fast enough to get to where they think the ball is going to be..and to be there before the ball does. Different players adopt varying styles but generally your ready position should be an athletic stance which allows you to move quickly in any direction. I teach my players and students to place their hands on their knees as the resting pre-ready position in serve receive. 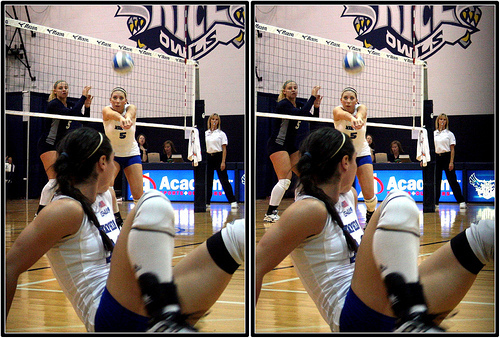 You have your hands on your knees while the server is bouncing the ball and going through her pre-serve routine. 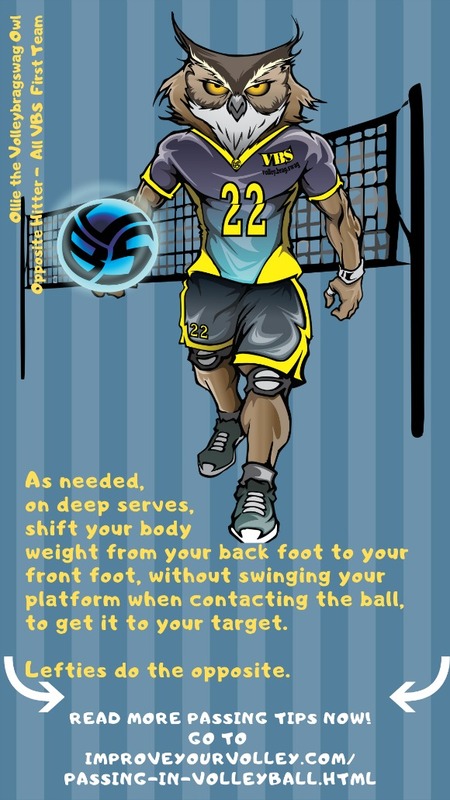 talk to your teammates that are passing with you about what serve the server may use - standing float or jump float serve? 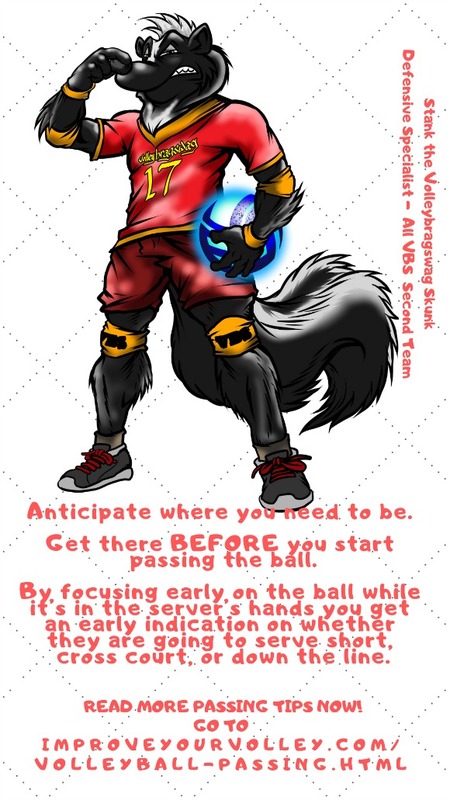 Just before the server tosses the ball you bring your hands off your knees to the ready position described at the beginning of this page. Many college and professional players choose to extend their arms in front of their body or out to the sides with their elbows bent at a 30 degree angle with their palms open towards the sky. I believe that whether you keep your elbows in front of you, keep your hands on your knees or have them out to the side is a personal choice. In my career I've tried both and I found that the one that I used the most was the one that allowed me to use my arms in a running motion, faster, so I could quickly run to the ball if I needed to, before presenting my platform to pass it. For me, holding my arms in front of me or putting my hands on my knees allowed me to do this faster. Passing Tips: You want to take the least amount of time to go from your ready position to actually contacting the ball, so you need to figure out which stance will allow you to do that. 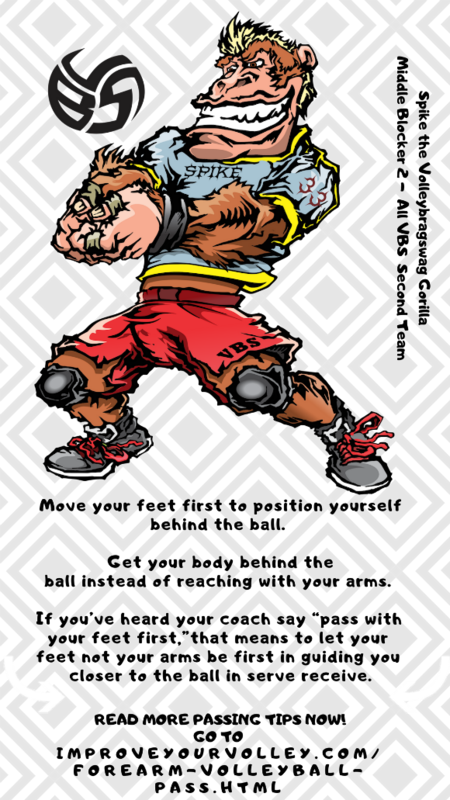 The key to remember is that you want to be as quick on the draw as possible and you want to take the least amount of time to go from your ready position to actually contacting the ball, so you need to figure out which stance will allow you to do that. Whether you call it the volleyball bump, the serve receive, the underhand pass or the forearm pass every player needs to master the art of controlling the ball while passing in volleyball. 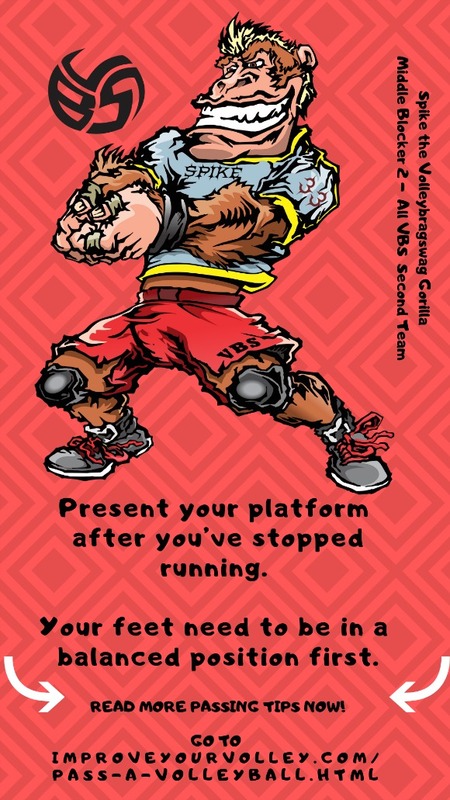 You do that by doing lots and lots of reps which we do and practice in our Boot Camp classes. 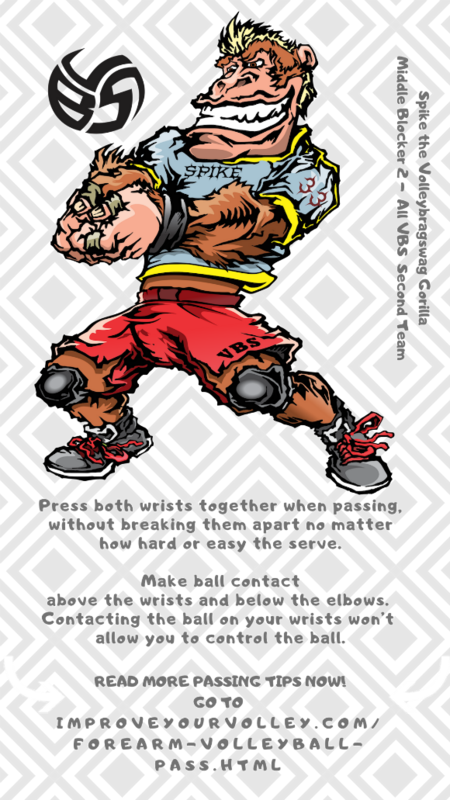 You can learn more about Passing in volleyball by visiting the Related Links below.